5 January is a religious and folk festival Tucindan in Serbia and Montenegro. Its name is related to verb tući that means “to beat”. Tucindan has pagan roots but like most of alike holidays was adopted by church and became religious. 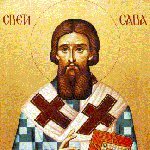 It is believed that Saint Sava, the first Archbishop of the autocephalous Serbian Church, introduced this holiday as a religious one. Tucindan is observed on Christmas Eve and has interesting traditions. All the men of family build a fire in the house yard and roast a pig (in some regions a sheep or a goose) on a long wooden stick. This roasted pig is a traditional part of Christmas dinner and called pečenica. People don't use any animal for pečenica but chose one and feed it with better fodder for one or two months before Christmas. This animal is killed on Tucindan by hitting on the head with a lump of salt. Then its throat is cut and blood is collected and mixed with fodder that is later given to cattle. It is believed that feeding cattle with this mixture makes them thrive. Another interesting tradition that is related to Tucindan concerns children. No one punishes children for their misbehavior. It is believed that punishment on Tucindan will make children naughty for a whole year.